Then, we talk with legal scholar Ryan Alford about his chilling study of how national security claims on the part of the executive branch have undermined the rule of law. His book is Permanent State of Emergency: The Demise of The Rule Of Law In The United States. Donald Trump ex-wife Ivana Trump once said that he kept a book of Hitler’s speeches by his bedside. He already uses the Nazi trope “fake news” — Hitler called it “the lying press” — and has created an office to track crimes committed by immigrants, like the one Hitler created to track crimes committed by Jews. His top aide Steve Bannon is a genuine fascist who has made no secret of his admiration for Nazi ideologues. Those are just a few of the worrying signs of the slide toward authoritarianism in the US. 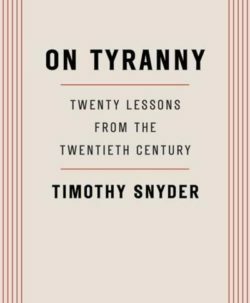 Timothy Snyder’s succinct and pithy book On Tyranny tells us what we must know about resisting that slide. The book is a kind of vaccine to inoculate us against acquiescing to authoritarianism and to strengthen the American political immune system to fight it. Timothy Snyder is Professor of History at Yale University and a Committee on Conscience member at the US Holocaust Memorial Museum, He’s the author of several previous books, including Bloodlands and Black Earth. In our first segment, historian Timothy Snyder talked about the threat of authoritarian rule in America if We The People don’t stop it. But how did we get here in the first place? 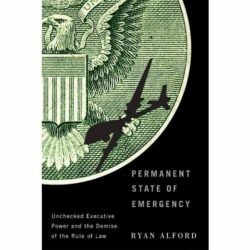 Our next guest lawyer and constitutional scholar Ryan Alford shows in his book Permanent State of Emergency that it didn’t start with November’s election. It started after 9/11, when the US launched initiatives that eroded both constitutional and international law: like the indefinite detention and torture of detainees at Guantánamo, targeted killing, and mass surveillance. Alford argues these policies legitimized an expansion of executive authority that negates the rule of law and undermines government checks and balances. Ryan Alford teaches law at Lakehead University in Canada. His research focuses on the rule of law and legal rights during public emergencies. Alford says he was compelled to write Permanent State of Emergency by two court cases he was consulted on, both involving the Islamic cleric and American citizen Anwar Al Alaki who was killed by an American drone on the orders of Barack Obama.